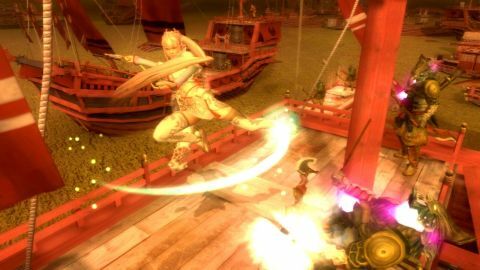 If you're lucky enough to get a PS3 on launch day and you've got a burning hack-and-slash itch, Genji: Days of the Blade might look like a pretty good way to scratch it. It's stylish and pretty, and its Onimusha-style samurai-on-demon action is fast and visceral. But while its dazzling visuals and animation are a decent showcase for what the PS3 can do, don't be fooled - scratch the surface, and there's very little here that qualifies as next-gen.
Set in ancient Japan during the legendary Genpei War, Days of the Blade continues the story begun by 2005's mostly excellent Genji: Dawn of the Samurai. As you wade through dungeons, sweeping mountain landscapes and recreations of actual battles (re-imagined with lots of demons, magic and giant skullfaced crabs, of course), you'll bust out flashy, flawlessly animated sword combos on hordes of monsters and solve simple puzzles. You'll also be able to switch between four warriors on the fly, each with their own upgradeable combos and special abilities. Acrobatic swordsman Yoshitsune returns from the first game with a new complement of Prince of Persia-style moves, and he's got his hulking, giant-pillar-swinging retainer Benkei in tow. Joining them are Lady Shizuka, a young priestess who whips around circular blades on wires, and Buson, a spear-toting god who's possessed the corpse of the first game's final boss. Their varied talents inject a lot of variety and even a little strategy into what might otherwise be a stale exercise in button-mashing. Unfortunately, not even the cool blade-brawling can keep the game's repetitive, interminably lengthy battles interesting for long. Description A pretty-looking (if generic-playing) slash-'em-up that continues Genji: Dawn of the Samurai's foray into Japanese historical legend.